A collaboration between Hero Arts and Ellen Hutson birthed these tweet little birdies (haha!) – and I had to airbrush them into a sweet little heart. See the rest of the cards on the hop using the list further down in this post – many cute cards to come, I’m betting! I’ll have another card later this week on Ellen’s blog so keep an eye out! Watch the video below, or click HERE to see it in HD on YouTube. Lots of shapes can be airbrushed behind images – and if you don’t have an airbrush, just use some inks and a blending tool! To celebrate the release, two randomly selected commenters will win a $30 gift certificate to the Ellen Hutson shop! To enter just leave a comment on the Ellen Hutson Classroom blog by 11:59 PST on January 28th. For those who participate in Bible Art Journaling – today’s is watercoloring God-rays! Beautiful card. Love to see how others correct/adapt errors, reminds me there are no mistakes only embellishment opportunities. Birds and a wonderful heart. Perfection. Nicely done. I love that you are not afraid of color! Your branch and leaves worked out perfectly! This is a great bird set! These birds are adorable and they truly radiate love with your beautiful colors!! Very cute! I love the vibrancy of the air-brushed heart! 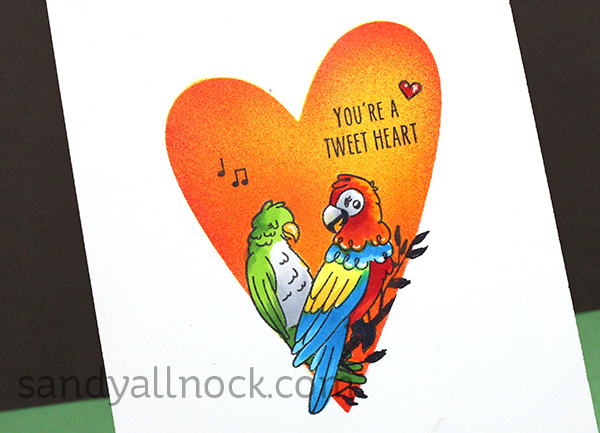 The bird stamps work well in your airbrushed heart. Love the birds – and the coloring!!!! Need to get my air brush out and do the masking technique…great video Sandy! Just beautiful! Love the vibrancy! Gorgeous card, I love all the vibrant colours! Thanks for an other great video. Love the United We Flourish stamp set BETTER TOGETHER! Great card, I love the airbrushed background and your coloring of the birds! Sandy, I love your videos as I always learn something from each one. I have never airbrushed anything but after seeing this gorgeous card , I’m going to have to try it. Your card is beautiful! Love those awesome birds! Your cards always amaze me!! I love those birds. Thank you for sharing your talent. I just returned from Creativation. I don’t know of a single booth that didn’t have gold in their samples. I LOVED your Go for the Gold class. With Olympics and gold being such a trend this year, I think it’s time to do a rerun of that class or maybe a follow-up with new products. Love your work, including the video tutorials you make! I especially love it when you ‘err’ and show how to compensate or cover it up. Very cool. luv the airbrushing AND the bottom border. wink! wink! Great, colourful card of those little birds, even your oops did not get your feathers ruffled. Love the add strip at the base of the card, cleverly using the same colours. And my mailing address is on the bottom of the blog subscription emails. As well as on my contact page. 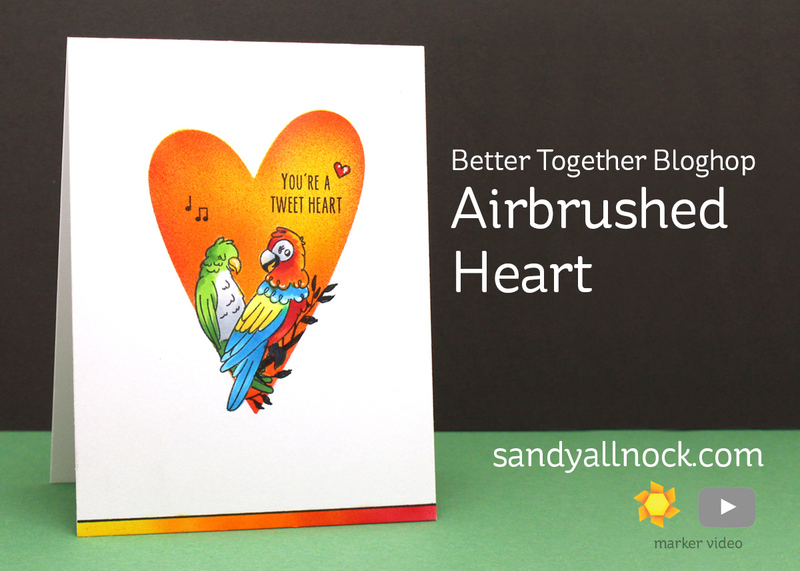 Love the air brushed heart for these colorful birds. Fabulous card, I like your branches. Such pretty birds? I love to watch you color or draw. Great artist!